Spanish or Australian Red with Slow-Cooked Lamb Korma? On a cold rainy January day there is nothing better than something cooked in our crockpot and Lamb Korma from the Slow Cook Book was ideal. Cubed lamb is fried with onions, ginger, garlic and a spice mixture of dried red chillies, cardamon, cinnamon, cloves, black peppercorns, cumin, mace and paprika. The lamb is then slow-cooked with yoghurt and a little salt. Double cream is stirred through towards the end of cooking. The korma is then garnished with coriander and served with pilau rice. We mopped up the sauce with naan bread. Delicious. We opened a bottle of The Hundred Cabernet Sauvignon Reserve 2011, a full-bodied Australian red from the Sunday Times Wine Club. There was an initial sweetness, followed by intense blackcurrant fruits and a smooth, spicy finish. 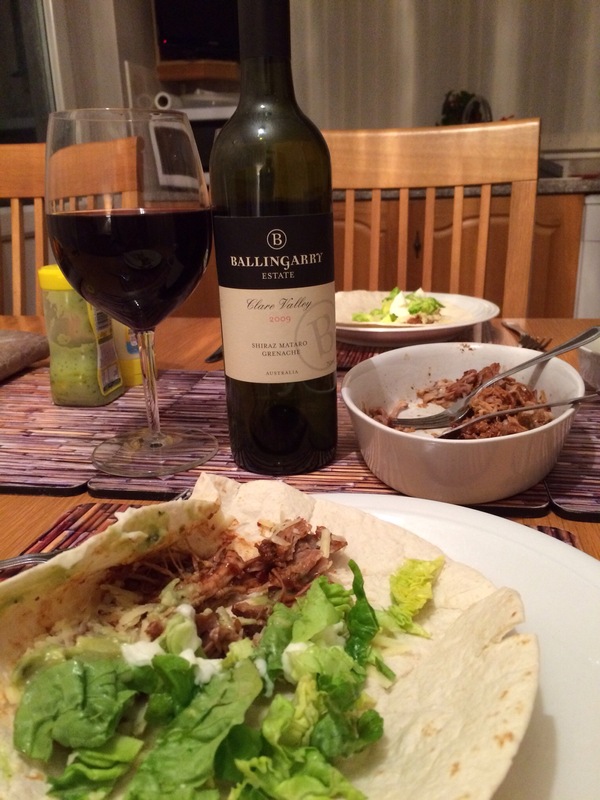 The wine was a good match with the korma, but we have enjoyed better pairings with this wine, such as this one. 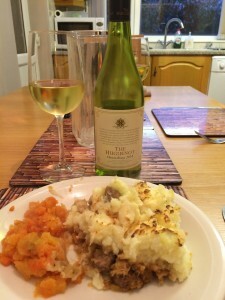 However, we managed to improve on the pairing with the leftovers. We opened a bottle of Campo Viejo Rioja Gran Reserva 2009, a medium-bodied Spanish red from Costco. This wine is a blend of Tempranillo, Graciano and Mazuelo. 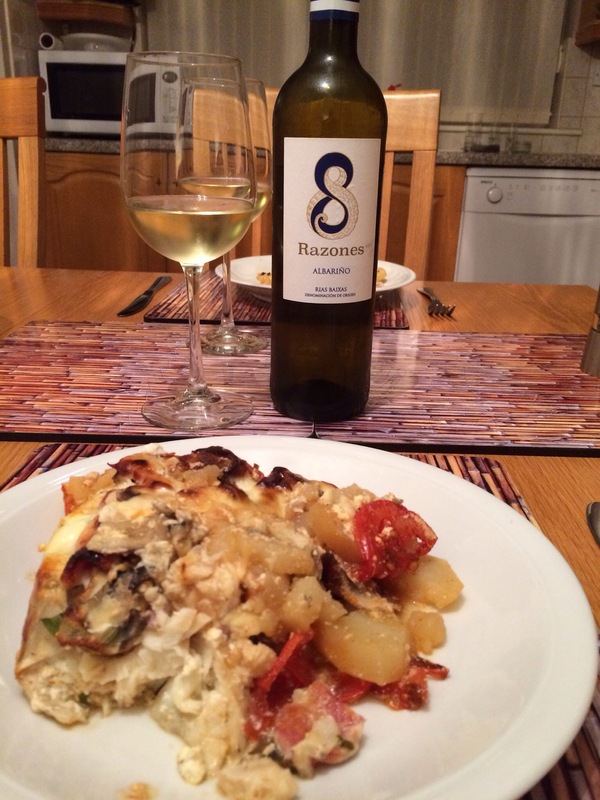 We loved its sweet, creamy smooth vanilla red fruits, with a lovely savouriness on the finish. 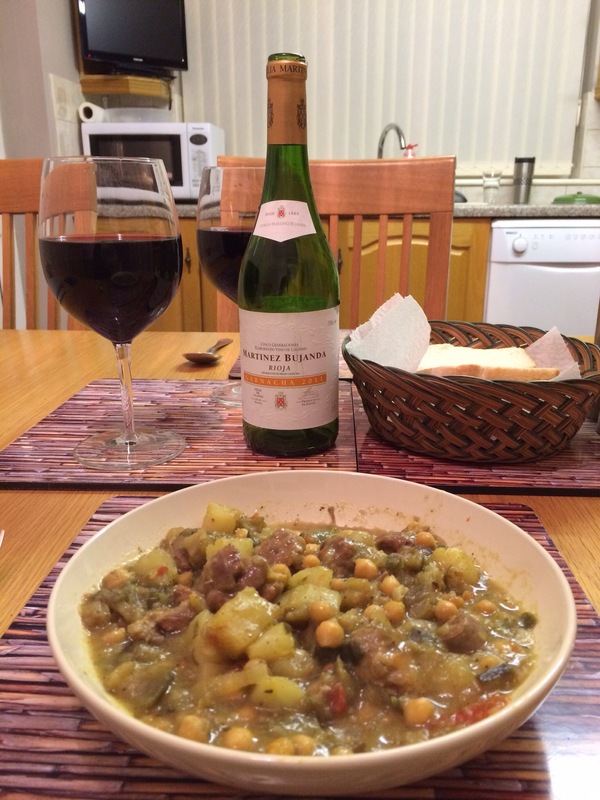 A very good match with the korma. Posted on January 1, 2016 January 9, 2016 Categories Full & Rich, Medium Bodied, Red WineTags Asian, Australian Red, Cabernet Sauvignon, Costco, Curry, Graciano, Indian, Lamb, Mazuelo, Spanish Red, Sunday Times Wine Club, Tempranillo, The Slow Cook BookLeave a comment on Spanish or Australian Red with Slow-Cooked Lamb Korma? 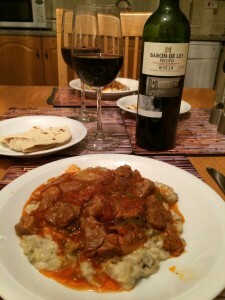 Which Spanish Red with Lamb Stew with Vegetables? 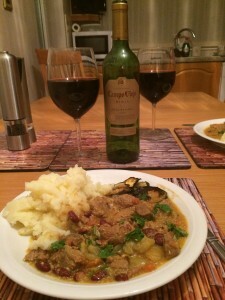 We cooked a favourite we had not enjoyed for a long time, Lamb Stew with Vegetables, a Supercook recipe. Cubed lamb is browned in a seasoning made from salt, pepper, nutmeg, mint and turmeric, then fried with onions. 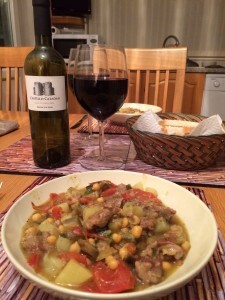 The lamb is casseroled with tomatoes, aubergines, courgettes, chicken stock and lemon juice. Cubed potatoes and chick peas are added later. We served this superb meal with crusty bread. 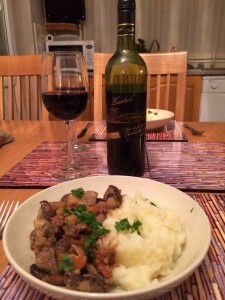 We opened a bottle of Castillo Catadau Gran Reserva 2006, a full-bodied Spanish red from Naked Wines. This Tempranillo was deep red in the glass and we tasted creamy vanilla spiciness, dark chocolate with smooth mixed red and black fruits. A very good match. We finished the leftovers the following evening and decided to stick with a Spanish red, but we opted for a Garnacha for comparison. 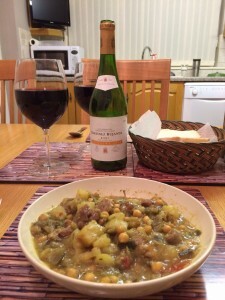 The wine was Martinez Bujanda Rioja Garnacha 2011 from the Sunday Times Wine Club. Again we tasted creamy vanilla but with more sweetness, red fruits and a smooth, savoury, spicy and creamy finish. A good match, but the Tempranillo worked better. 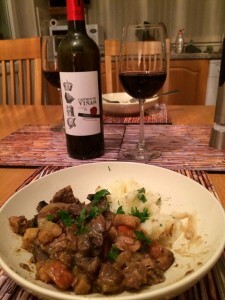 Posted on November 22, 2015 November 25, 2015 Categories Full & Rich, Red WineTags Garnacha, Lamb Stew, Naked Wines, Spanish Red, Sunday Times Wine Club, Supercook, TempranilloLeave a comment on Which Spanish Red with Lamb Stew with Vegetables? 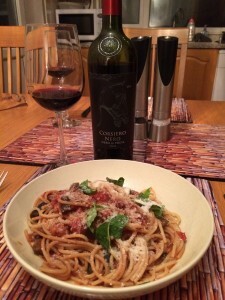 We tried Pasta alla Norma from Jamie Oliver. This famous Sicilian recipe includes a pasta sauce made from aubergines, olive oil, oregano, red chilli, garlic, frsh basil, white wine vinegar, chopped canned tomatoes and seasoning. Ricotta is used in the authentic recipe, but we used Parmesan. We served with spaghetti. A very tasty meal. Research online suggests the Sicilian grape variety Nero d’Avola is a good wine pairing. 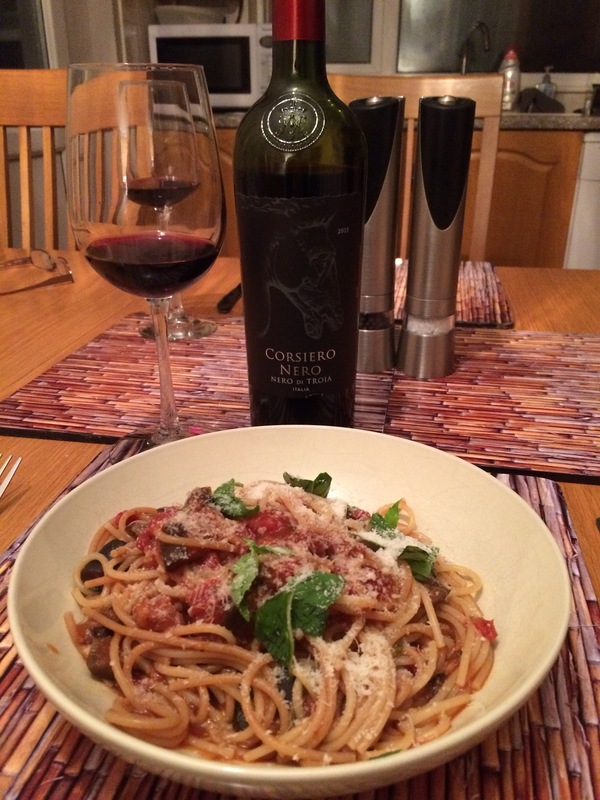 We didn’t have a bottle but we did have Cosiero Nero, Nero di Troia 2013, an Italian red from the Sunday Times Wine Club. This full-bodied wine is from Puglia and we found black fruits on the nose with a palate of black fruits, vanilla sweetness and a smooth, spicy finish. A good match with the pasta.